The first article is about an Irishman who gets it, UK MP and Environment Minister Sammy Wilson. Wilson calls the money spent trying to reduce carbon emissions "a giant con." He voiced his opinion that "in 20 years' time we will look back at the whole climate change debate and ask ourselves how on earth were we ever conned into spending billions of pounds which are going into this without any kind of rigorous examination of the background, the science, the implications of it all." That question will certainly be asked. But I think we already have the answer . . . liberals. The second article actually shows a believable reason why the earth has been cooling (yes my environmentalist friends - cooling) for the past two years . . . decreased solar activity. Is there any chance that Al Gore will admit that something outside human control could be having more effect on the planet than even his carbon footprint? The second article is noteworthy for one other reason . . . a speech from Barack Obama's science advisor-to-be is referenced. 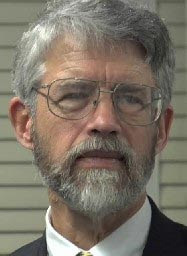 In that speech, John Holden (shown here) listed "limiting population" at the top of his ten solutions for global warming. What are people? Parasites? A plague on the planet? Watch out for "population control" measures from the Obama administration. Changing winds at the GOP? 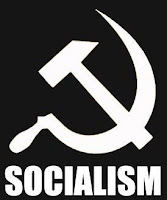 Republican National Committee Vice Chairman James Bopp, Jr., and Oregon party member Solomon Yue will offer a resolution next month that the Washington Times reports will accuse "President Bush and congressional Republican leaders of embracing "socialism." While I might (or might not) quarrel with the verb, I don't disagree with the sentiment. The GOP in Washington has abandoned the right in favor of "centrist" or "populist" or "bipartisan" leftist policies. As Yue put it, "we can't be a party of small government, free markets and low taxes while supporting bailouts and nationalizing industries, which lead to big government, socialism and high taxes at the expense of individual liberty and freedoms." 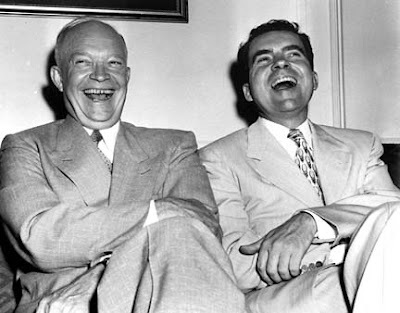 The Republican Party must be conservative again or it will fade into history. Absence makes the readership grow fonder? To those of you who expect your daily dose of conservatism from the SLC - and haven't been getting it - I do apologize. While I do enjoy blogging, it is far from the most important pat of my life. In recent days and weeks, the time that I have spent on those other parts of my life has significantly increased pushing this site to the back burner. Unless I suddenly find a way to carve more than 24 hours out of a single day, I do not expect things to change in the near future. For the months since this blog was created, I have been more-or-less committed to posting five days each week. I no longer feel committed (even if some say that I should be). SLC will not go dormant. And I have not been silenced. I will continue to post when time allows. Thanks to the readers for reading - and for understanding. The global warming crowd is lying low these days. For good reason. Hopefully, sooner or later, the world will realize that the facts simply don't support the environmentalists' caterwauling. Voices of sanity are also rising above the din. 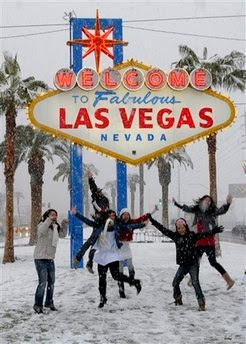 CNN Meteorologist Chad Myers is one of the latest. In this story posted by the Business & Media Institute, Myers points out that human beings are probably incapable of warming the planet. In fact, Myers said, "to think that we could affect weather all that much is pretty arrogant." Dr. Jay Lehr, described in the same story as "an expert in environmental policy" brought facts to the debate. 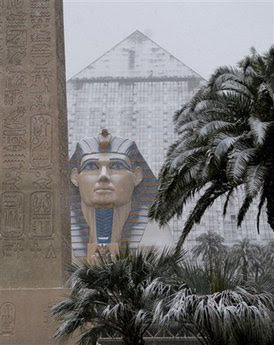 He is quoted as saying that "if we go back really, in recorded human history, in the 13th Century, we were probably 7 degrees Fahrenheit warmer than we are now and it was a very prosperous time for mankind." Lehr's data shows that the planets temperature has risen and fallen throughout time, even before the industrial revolution and apoplectic fits from former vice presidents over greenhouse gas emissions. With a concerted effort, human beings might be able to marginally affect temperatures on Planet Earth. But . . . to think that we're so mighty that what we're doing now is causing global warming is, indeed, arrogant. 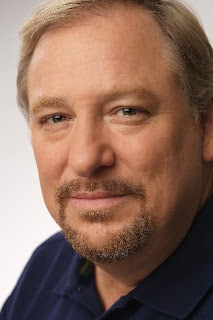 Rick Warren, pastor of Saddleback Church in Lake Forest, California, has been tapped to deliver the invocation at Barack Obama's Inauguration on January 20. Dr. Warren is unabashedly Pro-Life. The President-elect is certainly not. My initial reaction to this news was disappointment. I was disappointed to hear that a powerful Pro-Life leader would be seen on the same dais as a man who supports - or at the very least failed to oppose - infanticide. But after thinking about about it, my disappointment faded into indifference, and now I'm even beginning to be a bit, probably naively, hopeful . . . hopeful that buried within the invocation will be a petition for mercy on our nation for the sins committed against the unborn and a request for a divine hand to guide our new leaders on life issues. Dr. Warren has an opportunity here. Will he take it? Today, I'm quite thankful for the Twenty-second Amendment to the United States Constitution, which limits individuals to two terms as President. No, I'm not happy that Barack Obama will be taking office but it is definitely time for George W. Bush to leave. What's next? Abandoning the principles of limited government to save federalism? Oh, wait, that's already been done. Maybe abandoning principles of freedom to protect the Bill of Rights? Back in 2000, it sure seemed like we were electing a conservative. And President Bush, to his credit, has done some things right. But it sure seems like he fell into the D.C. trap and has been sliding to the left since his arrival, doesn't it? 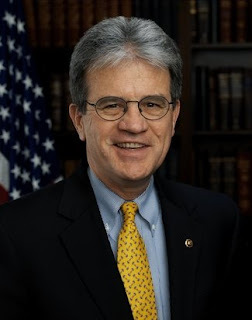 Coburn told CNSNews.com that "all we asked [of the UAW] was, 'Just give us a date at which you will have competitive wage rates'" with non-union foreign automakers' plants in the U.S. But the union refused to consider renegotiating their contract with General Motors. The union would, apparently, rather see GM go down than to take a pay cut to get their wages back in line with reason. Coburn is right on the point he's making. But I do have one problem . . . it seems that he thinks the government bailout is a good idea. If he opposes the idea in principle but is simply working to tweak what he feels is inevitable - then he gets it - without reservation. 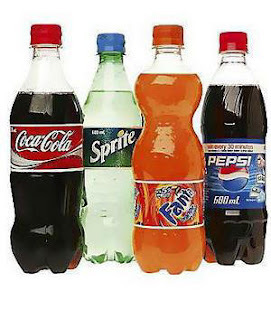 Yes, that's right, Pepsi and Coke will now join cigarettes and alcohol as "sins" ripe for their own special tax. What's next? Candy? Cookies? Hamburgers? Why not, after all, couldn't more revenue be raised by taxing anything and everything fattening? The number one reason, of course, for the fat tax in New York is to take more money from the people who earned it to allow the government to spend it. But the reason given is to protect the public health by forcing a healthier lifestyle. Hogwash! The government needs to stop using the tax code in an effort to dictate citizens' behavior. Get out of our lives and our kitchens and let us eat and drink what we what to eat and drink. Governor Patterson (and your ilk) . . . leave us alone! Just adding another link here to show you how out-of-control Gov. Patterson's tax proposals are. 12/16/08. SLC. 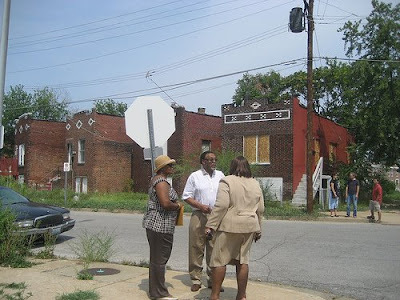 Earlier this month, a St. Louis City alderman (Kacie Starr Triplett) proposed designation of Delmar Boulevard as "Barack Obama Boulevard." (Link to KSDK story here.) The idea to name a street in honor of a man who hasn't done ANYTHING yet was, of course, just plain silly and - because of other things going on - didn't even warrant a mention in this space. Let me repeat, HE HASN'T DONE ANYTHING YET. But he's got a children's book about his life on the shelves at Target, on sale this week. I happened to make a Target run today and took a look at Barack while I was there. I almost lost my lunch. Winter dedicates the book to Obama, "with much love and admiration" and proceeds to tell the "story" of this man "whose history-making presidential candidacy was largely due to the quality of his character" and "achieved greatness." Obama hasn't even taken his oath of office yet and his cult of personality's primer is in print. 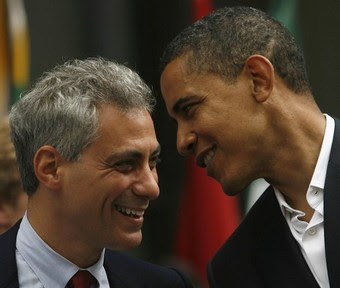 While attempting to distance himself from his one-time political pal, Rod Blagojevich, there is no way that Barack Obama can distance himself from Rahm Emanuel, the Chicago Democrat hand-picked by Obama to serve as his White House chief of staff. 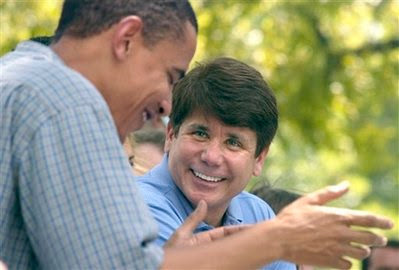 Unfortunately for Obama, Emanuel connects him to Blagojevich. This morning, Emanuel refused to answer questions about whether or not he was the Obama "advisor" named in the criminal complaint against the governor. That Obama "advisor" apparently suggested that if Blagojevich appointed a friend of Obama's, Valerie Jarrett, to the U.S. Senate that Blagojevich would would be rewarded - but not immediately - because rewarding him now wouldn't look good. But Blagojevich didn't want to wait and went ballistic. 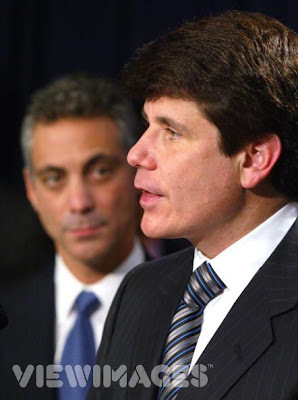 Was Emanuel offering to compensate Blagojevich down the road for a political favor now? And, if so, was he doing so on his own or under orders? Serious questions deserve serious investigation. Can the media be counted on to conduct it? 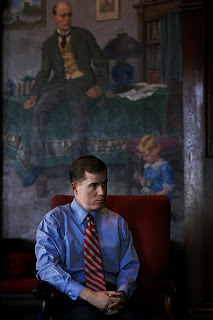 Jim DeMint: Still telling it like it is. South Carolina Republican Senator Jim DeMint is still right on the money when discussing the bailout of Detroit's Big Three automakers. Check out this piece from the Business & Media Institute. DeMint is warning of the consequences of this ill-advised bailouts. First, he suggests that "we're going to have riots" of workers who lose their jobs in industries not bailed out. Those workers, logically, will wonder why their job wasn't saved by a government bailout when others were. And who could blame them? Second, the bailouts (of the financial industry, auto industry, and any other sector that follows) "will result in inflation" because of the amount of money borrowed and/or printed anew to finance it. The government should not be in the business of propping up some employers (and their employees) while letting others fail. And since there isn't sufficient money to prop up all employers, the only fair option is keeping their fingers out of industry - if one goes bankrupt, that's why we have bankruptcy laws. And printing money is not an answer that our economy can live with. And who is really to blame for pushing the Big Three bailout this far? DeMint has that answer too . . . "the primary driver behind this is the unions because bankruptcy allows the auto companies to basically restructure all their contracts . . . then essentially the unions lose all their leverage." A politician telling the truth is like a breath of fresh air. As crooked as can be? 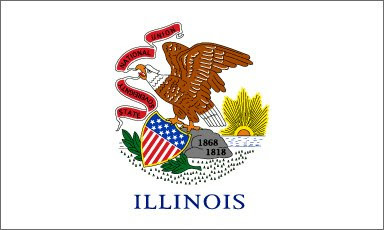 The news arose today that Illinois Governor Rod Blagojevich has been arrested and charged with corruption. And the news was no shock to anyone who has done business across the Mississippi. In a nutshell, Blagojevich is accused of offering to appoint the highest bidder (or the hand-picked choice of the highest bidder) to Barack Obama's now vacant U.S. Senate seat. Blagojevich has been accused of corruption before. And Illinois has been viewed as corrupt before, but this might just take the cake. It looks like one more corrupt Chicago politician could be going to the penitentiary . 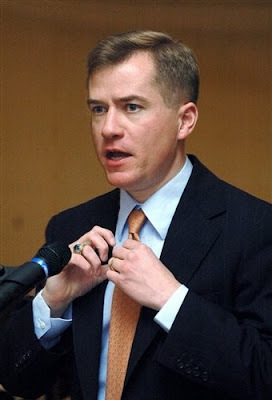 . . but a fellow Chicago politician and a friend of Blagojevich's will be moving to the White House next month. Barack Obama is connected to the governor of his home state. According to Jake Tapper of ABC News, Obama "not only endorsed Blagojevich in 2002 and 2006, [he also] served as a top adviser to the Illinois governor in his first 2002 run for the state house." 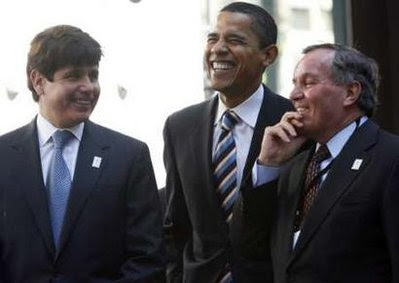 Obama and Rahm Emanuel (Obama's selection for White House chief of staff in his administration) were two of the four people who "met weekly" to "lay out the general election" of Blagojevich in 2002. 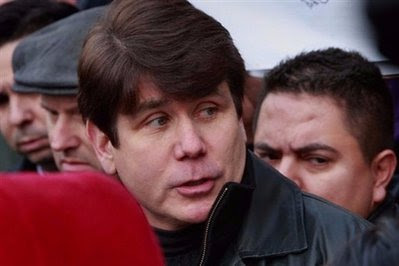 This, according to Emanuel himself, though he later retracted the statement - downplaying their connection to Blagojevich. The question is this, should be judged by the company he keeps? Especially if that company includes Jehrimiah Wright, William Ayers, and Rod Blagojevich? 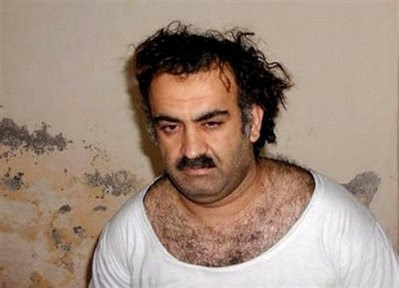 The soon-to-be-no-longer-alleged mastermind of the September 11, 2001, attacks on the United States of America, Khalid Sheikh Mohammed, stated today that he intends to confess to his crimes. (Read the Associated Press story here.) Four other complicit terrorists dropped their defenses as well. According to the AP reporter, these men are "in effect daring the Pentagon to grant their wish for martyrdom." Here's to accepting that dare. Maybe God will have mercy on these mens' souls . . . they should be glad that it is up to Him and not me. A Car Czar . . . what is this country coming to? In exchange for the short-term bailout, the automakers will be saddled with an overseer, dubbed the "car czar," who will be "in charge of setting guidelines for an industrywide overhaul, with the power to revoke the loans if the carmakers [aren't] taking sufficient steps to reinvent themselves." 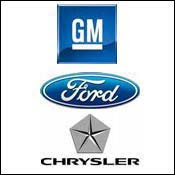 In other words, General Motors, Ford, and Chrysler won't be running General Motors, Ford, and Chrysler anymore. Instead, the feds will be running them all. And why not, the government has already claimed a stake in the banks. Brilliant, don't you think, central planning has worked so well everywhere it has been tried. Memo to Congress: Please stop the madness. The itsy-bitsy spider went up the water spout. . .
A children's classic, performed here by Missouri Governor Matt Blunt. 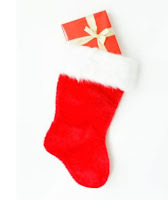 How better to celebrate the birth of the Christ Child than to stuff someone's Christmas stocking with an abortion gift certificate. The concept is inappropriate and disgusting . . . but what would you expect from Planned Parenthood? Matt Blunt's Legacy? Missouri's Financial Strength? I've haven't been a big fan of Matt Blunt since he took office. But perhaps the conservative principles and spending priorities that he brought to the state budget deserve some recognition. Click here to check out Tony Messenger's piece from today's St. Louis Post-Dispatch with the intriguing title . . . "Missouri not hurting as much as some, thanks to Gov. Blunt." "Obama Plans Largest Building Program Since 1950s"
That was the Bloomberg Press headline for a story yesterday that covered President-elect Barack Obama's speech indicating that he plans to "make the 'single largest new investment' in roads, bridges and public buildings since the Eisenhower Administration." Question: Where's the money to pay for it going to come from? Today, Jake Wagman at the St. Louis Post-Dispatch reported that an alderman from the City's north side, Quincy Troupe, is actively encouraging law-abiding residents to buy guns and learn to use them to defend themselves since he no longer has confidence that the police department can or will protect citizens of his ward. In the car this afternoon/evening, I heard Mark Reardon interviewing Troupe on KMOX. Troupe seems fed up with the violence in his ward. And who can blame him. The Post reported that there were nine homicides there in the first ten months of the year. But Troupe seemed more frustrated with the St. Louis Metropolitan Police Department's response to the rampant violence. Response times for reported crimes are so slow that the department is becoming irrelevant in Troupe's ward. Some constituents, he claimed, aren't even calling the police anymore to report crimes because doing so would do no good. If the police can't - or won't - defend you or your family, what is a responsible person to do? There is only one answer and it is clear - do the job yourself. The solution is sad, but Quincy Troupe can't think of another one. Unfortunately, neither can I. Fool me once, shame on you. Fool me twice, shame on me. Fool me a third time? George H. W. Bush talked like a conservative when he was running for election. He promised not to raise taxes and raised taxes once in office. George W. Bush talked like a conservative when he was running for election. He managed to outspend his father and everyone else. Now, according to Marc Ambinder, Jeb Bush, the former Florida governor and next in line to the Bush Family Throne, is considering a run for the U.S. Senate. 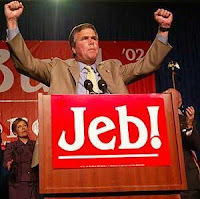 And, while sounding like a moderate on immigration, Jeb is following his family's playbook. 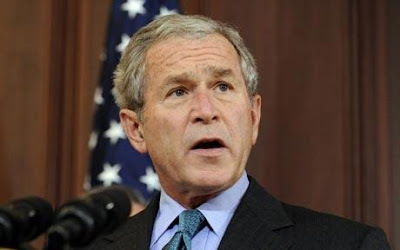 Ambinder writes that "Bush said that Republicans can't give up on conservatism and . . . that Republicans 'can't be Democrat-lite. We can't just 'get along.''" Jeb's words are right on the money, of course. But how many times will conservatives keep giving Bushes chances? I know that Thanksgiving has passed but today is another day of thanks for conservatives, Republicans, and anyone else fearful of unchecked Democrats running roughshod over Washington beginning in January 2009. Thanks today go out to voters in Georgia who re-elected Republican Saxby Chambliss by a wide margin ensuring that no matter how many votes Al Franken "finds" in Minnesota, Democrats will not have a filibuster-proof sixty seat majority. Wednesday afternoon update: Just who does Senator Chambliss credit for his big win? Sarah Palin, who flew in and campaigned around Georgia on his behalf Monday. According to Chambliss, Palin "is a dynamic lady, a great administrator, and I think she's got a great future in the Republican Party." 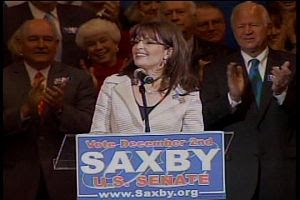 Sounds to me like Chambliss will be standing in line, behind me, to offer his endorsement when Palin announces her 2012 candidacy for president. Who else will be in that line when it does finally form?